In traditional Chinese medicine (TCM), the blood is the basis of a woman’s makeup, “女子以血为本”. All important body processes that women go through in life – menstruation, pregnancy, birth and lactation – involve blood. For women to stay healthy and strong, our blood needs to be sufficient to support the life processes that we go through. Consequently, many women’s illnesses are a result of disturbances in the blood. Common disturbances include blood stasis (血瘀), blood heat (血热) and blood deficiency (血虚). Some of these disturbances may not necessarily lead to diseases, but they may cause certain symptoms that can accumulate in the long run, leading to serious health concerns. Symptoms associated with blood stasis include aches and pains in the body, dark complexion, rough and scaly skin, and dark-coloured lips and tongue. If you fall under this category, consume a brown sugar drink, rose flower tea or a little red wine a day to boost blood circulation. More regular exercise will also increase overall energy levels and improve blood flow. Women with blood heat tend to feel warm and develop a sore throat easily. They also tend to be temperamental, develop acne and have a bright red tongue. To counter blood heat, you can eat more bitter gourd, red beans and water chestnuts, as well as drink chrysanthemum tea and barley water. Heart palpitations, giddiness, insomnia, pallor and a light-coloured tongue are signs that can be associated with blood deficiency conditions. If you tend to have these issues, try incorporating some Chinese herbs in your diet, such as e jiao (阿胶), wolfberry (枸杞子), red dates (红枣) and longan (龙眼). You can also eat more black beans, spinach, black fungus and lotus root, which are good for replenishing blood. It is advisable to visit a TCM physician to get proper advice or treatment, if necessary, to balance the blood disturbances in your body before they lead to other more serious problems. No matter which stage of life you are at now, it is never too late to start nourishing your blood and caring for your body. 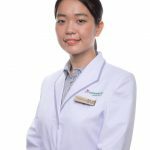 Physician Zhou also practices at Thomson Chinese Medicine (United Square).